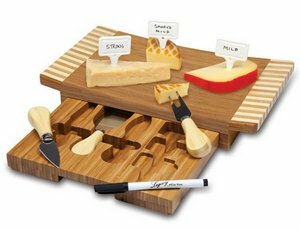 The Concavo cutting board and cheese tools set is compact and sleek. 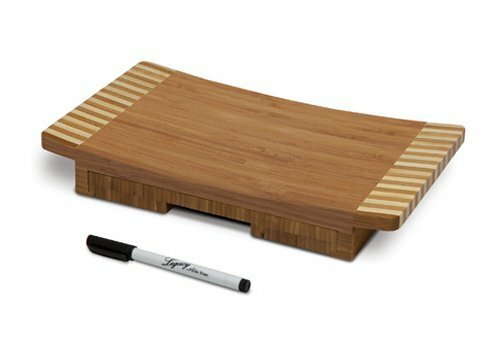 It measures 13.5in x 8in x 2in and has a dark bamboo cutting surface and pull-out tools drawer with zebra wood panels/tray handles on either side. The surface of the board is slightly sunken in the center, giving it form and function. It includes three cheese tools, three porcelain cheese markers, and a wet erase pen. Use the Concavo whenever you serve a cheese assortment at your parties and get-togethers and get the conversation started!